Discussions Magazine Music Blog: HOWARD JONES: Deluxe expanded editions reviewed! HOWARD JONES: Deluxe expanded editions reviewed! Howard Jones was a unique voice in the ‘80s. While his hits were extremely memorable (and still receive a lot of airplay all around the world), his albums were a lot more sophisticated than his singles would lead you to believe. 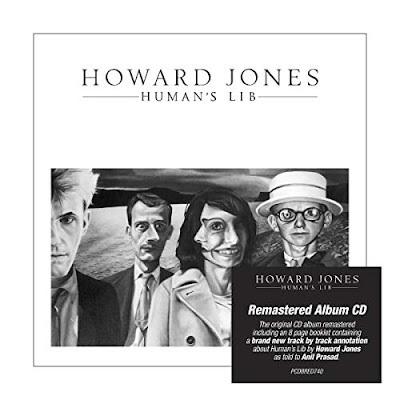 Like Nik Kershaw and Level 42, Howard’s music was informed by Jazz and World Music, which added more texture to his recordings. Although his singles were driven by delicious Pop melodies, Howard preferred to experiment with sounds, structures and arrangements which ensured that his music would continue to evolve over time. More than just a flash in the pan, Howard created intelligent Pop music that is ripe for reappraisal. Cherry Red Records is giving listeners the opportunity to immerse themselves into Howard’s early years with the expanded reissues of his first two albums HUMAN’S LIB (1984) and DREAM INTO ACTION (1985). The expanded 2CD + DVD edition includes the original album’s 11 tracks plus five remixes and one instrumental on CD One. The second CD features 13 additional alternate mixes and non-album tracks. The DVD features pre-fame rehearsal footage when his live show was more performance art, plus TV appearances (including a couple tracks with live vocals) and the music videos for the album’s singles. And yes, Jones’ mime sidekick Jed Hoile appears on most of the DVD. While not exactly overlooked three decades on, Howard Jones is ripe for rediscovery by those that only know his hit singles. These are the albums that set his career in motion and some might even suggest that they are his finest platters. In any case, it is time to revisit HUMAN’S LIB and DREAM INTO ACTION with these two brilliantly compiled expanded editions. NOTE: Each album is also available in a Super Deluxe Edition containing three CDs, two DVDs and a picture disc vinyl pressing of the album PLUS bonus material.